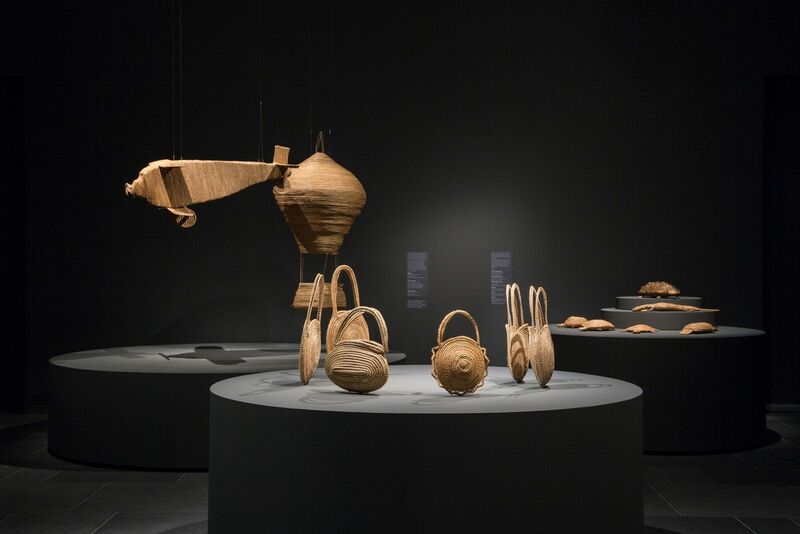 One of the highlights of TARNANTHI is the comprehensive survey exhibition of master Ngarrindjeri weaver, and internationally esteemed artist, Yvonne Koolmatrie. Embedded in the traditions of Ngarrindjeri culture and animated by her boundless imagination, Koolmatrie’s elegant woven forms are created using the labour-intensive process of hand harvested river sedge from the banks of the Murray River. Suspended eel traps will launch visitors on an immersive journey through a remarkable artistic practice spanning three decades and featuring over sixty works of art, including iconic works from institutions across the country and newly commissioned work. The RIVERLAND curatorial team comprises TARNANTHI Artistic Director Nici Cumpston, curator and writer Hetti Perkins, and artist and curator Jonathan Jones, with the exhibition developed in close consultation with Koolmatrie. All of these voices are heard in the lavishly illustrated publication which is edited by Genevieve O'Callaghan, and includes extensive interviews with the artist.